On Digital Dating: Never Committing, And Never Breaking Up : All Tech Considered Today, with texts, Facebook, Twitter and Instagram, it's easy to keep relationships ambiguous and uncommitted. But keeping a digital distance from exes is also next to impossible. 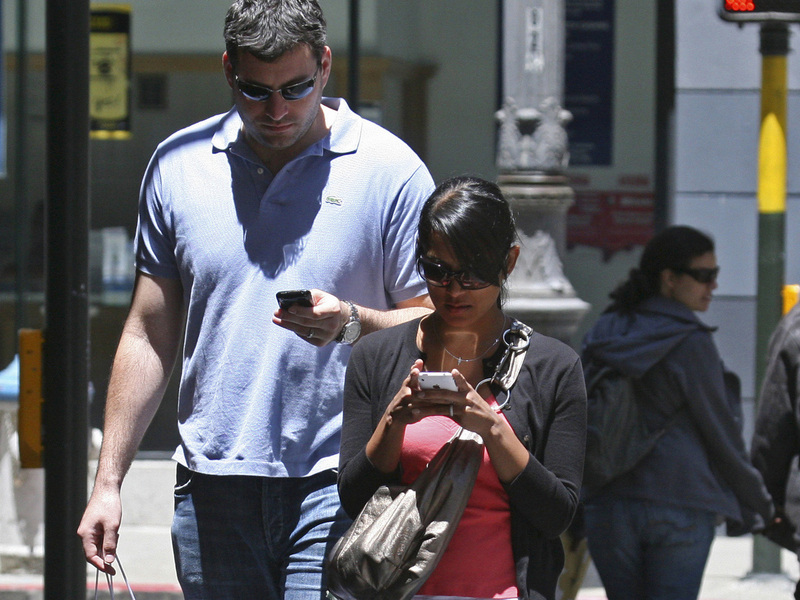 Texting and social media make romantic ties simultaneously easy to avoid and harder to shake. I've been out of the dating world for the past decade, which makes me unqualified to speak from personal experience but intensely curious about how technology has upended courtship conventions. Based on the recent headlines, it seems an interesting paradox has emerged: Texting and social media make romantic ties simultaneously easy to avoid and harder to shake. "Not since the dawn of the automobile has a technology — the cellphone — so swiftly and radically changed the way people interact, meet and move forward (or not) in a relationship," writes USA Today, in a piece that ran last week. Texting or tweeting beats talking because it keeps flirtation casual, protects you in case of rejection and, in so many cases, tends to hang a lingering ambiguity over a couple's relationship status. There was also a time, I am told, when staying in touch was difficult. Exes were characters from a foreclosed past, symbols from former and forgone lives. Now they are part of the permanent present. I was a college freshman when Facebook launched. All my exes live online, and so do their exes, and so do their exes, too. "It's a dozen soap operas playing at the same time on a dozen different screens, and you are the star of them all," O'Connor continues. "It's both as thrilling and as sickening as it sounds." These days, Snapchat, which promises "the lightness of being" by facilitating only self-destructing messages, can help you avoid a digital trail. And savvy entrepreneurs have clearly tapped into a need with an array of ex-erasing apps: MuteTweet, which keeps your ex out of your timeline. Ex-Blocker, a plug-in that makes sure no reference to certain names appears in your Web browser. KillSwitch crawls Facebook photos, videos and posts to systematically delete anything that mentions your ex. Ex-Lover Blocker activates a phone tree of your best friends when you call your ex and Facebook-shames you if you do. "There's even something called Eternal Sunshine, which removes unwanted status updates from your Facebook feed," writes O'Connor. "Eternal Sunshine" owes its name to the 2004 Michel Gondry film, Eternal Sunshine of the Spotless Mind, in which a man and woman are so wrecked by their split that they seek to erase their memories of one another. In the fictional universe, the mind-erasing operations did work, to heartbreaking effect. The moral of the film was that we actually need our pain as well as our pleasure to feel complete. So we could make cutting ties easier by living without a digital presence and dating the old-fashioned way — through talking — and be spared the reminders of one's ex after the relationship goes awry. Or we can jump into the digital present with knowledge that your hookup(s) are likely to always remain part of your digital past. Without technology, relationships can be confusing, consuming and often hard to forget. With technology, relationships are confusing, consuming ... and thanks to digital reminders, impossible to forget.